David & Frances are just a perfect couple. I first met up with them at the Stretton Fox pub to discuss their special day. 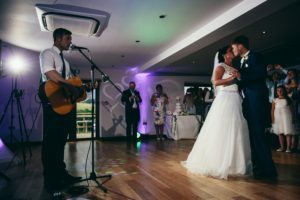 They asked that could we have a member of our family sing & play the guitar for our 1st dance. Yeah no problem at all they can use my system. The big day arrived at the Fisherman’s Retreat in Ramsbottom. A restaurant and wedding venue set in the Lancashire countryside. I arrived early to setup our Uplighting around the room and DJ setup all ready for the evening. Ian Horrocks turned up on the day as a guest with his guitar and what an amazing guy he was. He started to play the 1st dance, “Must be love by Madness!” and the whole wedding party sang along with him. After the 1st dance I took over and partied the night away till the early hours. Here are the highlights of the day ENJOY!!! It was absolutely fantastic. Thanks so much Lee! The room looked amazing with the uplights and music selection was perfect. If you know someone looking to celebrate their wedding soon, why not share this page with them using the dead simple share buttons at the bottom of this post.